ON THE GO OC - Things to do with your family. : KING Kong of Ice Cream Trucks, Kream Kong Coming to OC! 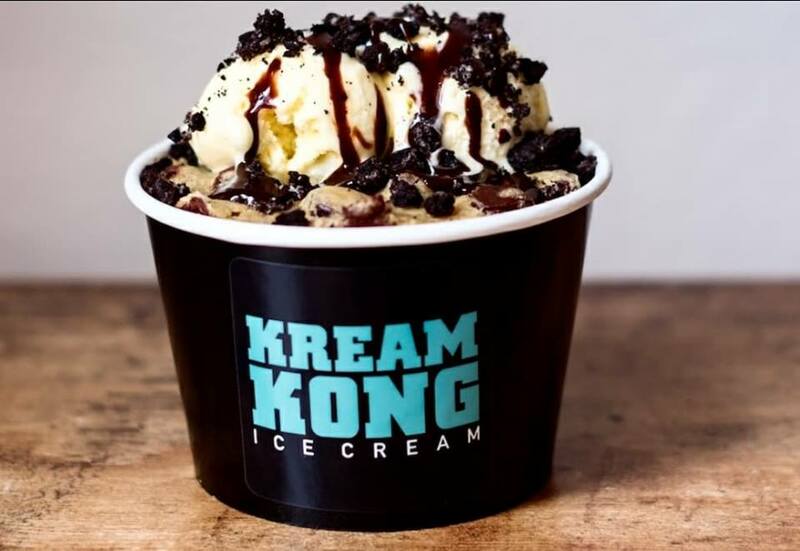 KING Kong of Ice Cream Trucks, Kream Kong Coming to OC! Kream Kong Ice Cream announces the upcoming launch of their ice cream truck, and will be appearing at popular foodie driven events and locations around the Los Angeles area. Their unique brand of handcrafted ice cream and fresh baked cookies was unveiled in early 2018 and has garnered early buzz with appearances at events such as OC Night Market. With the Summer heat in full effect, ice cream enthusiasts are actively seeking delicious treats to cool them down and rock their taste buds. Kream Kong has been making appearances at area food events, and will greatly expand their coverage in the Southern California area with their new food truck. 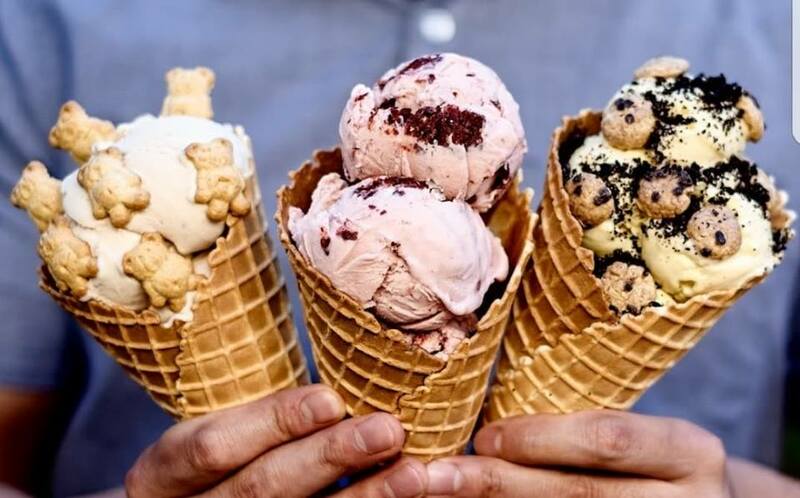 Launched in January 18’ by husband-wife founders Stephen & Diane Tchen, Kream Kong aims to put a smile on people’s faces and is excited for the dessert fans to experience their top quality ice cream and cookies. Kream Kong offers a rotating lineup of 8-10 flavors in cup or fresh handmade cone including vanilla, chocolate and strawberry alongside limited flavors including peanut butter and jelly, ube, red velvet, avocado, cookie butter, matcha and banana cream pie. All of Kream Kong’s super premium ice cream offerings are handcrafted, organic and made from locally sourced ingredients. In addition they will be offering special ice cream cones filled with either cookie butter topped with teddy grahams or vanilla topped with oreos and cookie crisp. To top off all this deliciousness, Kream Kong offers up the Kong’s Cookie, which was inspired by Stephen and Diane’s love for BJ’s popular dessert, the Pizookie. The Kong’s Cookie includes a vanilla ice cream base, and is topped with a fresh cookie with 2 mini scoops of ice cream. The initial cookie flavors sold at OC Night Market were chocolate chip and white chocolate macadamia, and upcoming Kong Cookies have been teased including blueberry and pumpkin for the fall season. Growing up, Stephen’s parents owned and operated a women’s shoe retailer, and was raised knowing that running a business that make customers happy is something to strive for. Diane’s father was also an entrepreneur, owning a successful trucking company and inspired her to follow a path of owning her own business. Both knew one day they would carve their own path and give back to their community, just as their parents did. Kream Kong has and will always pay it forward, and is actively involved with raising money for organizations such as kids little league in their hometown of Hacienda Heights. Kream Kong will be posting their truck schedule in late July and are also set to sell product at the popular 626 Night Market the weekend of 8/10. Stay Cool with a Sweet Treat this Summer!